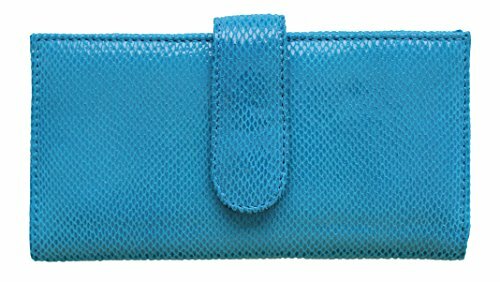 * Style: BA 184 * Color: Mamb Turquoise * Material: Genuine embossed leather * 100% brand new and high quality * Dimension: 7.25" L x 3.75" H x .5" D (18.5cm x 10cm x 1.5cm) * Snap closure * Leather lining * 12 interior credit card compartment * 2 interior side bill pockets * Inside can easily fit extra cards with the second snap * Perfect for every day, Travel and easy carry * This delicate handcrafted genuine embossed leather credit card holder is simple in style and design * Due to monitor variations colors may appear slightly different * Betty Audish and Audish is a trademark registered in the US. Our brand has gained recognition and protection from Amazon. We will not allow any forms of infringement. If you have any questions about this product by Betty Audish, contact us by completing and submitting the form below. If you are looking for a specif part number, please include it with your message.